Skin cancer has to start somewhere. Most often, it is a new growth or spot that appears on the body, continues to change, and increases in size. This includes pimples that do not heal and scars that appear without a history of trauma. 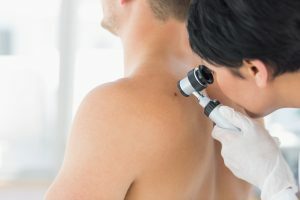 While there are many non-cancerous (benign) growths that occur over a lifetime, every new spot should be evaluated by a dermatologist and monitored to be sure. Cancer is defined by uncontrolled growth. Oftentimes, the speed of growth outpaces the blood supply, resulting in cell death and non-healing. A persistent sore or ulcer, a spot that bleeds spontaneously, or any lesion that repeatedly scabs could be an underlying skin cancer or pre-cancer. As a general rule, if a spot has not healed within 3 weeks, it should be considered suspicious. The body has an interesting way of communicating. Skin cancer may, in some cases, be associated with changes in sensation. Any mole or growth that is itchy, painful, or bothersome should be evaluated. A – Asymmetry: One half of the spot does not match the other. B – Border: The edges are jagged, notched or blurred instead of smooth, round or oval. C – Color: There is more than one color in the same spot. D – Diameter: The spot is larger than a pencil eraser (6 millimeters across). E – Evolution: Change in size, shape, color or appearance. Of the ABCDE criteria, the E is most important. By definition, cancer grows, making change the most important factor in identification of melanoma. Nevi in the same individual tend to resemble each other in size, color, shape, and clinical pattern. Any outlier, or spot that looks different from the rest, should be considered suspicious and evaluated immediately. Early detection and prompt treatment is curative in the vast majority of skin cancer cases. Any spot that is new, changing, growing, itching, bleeding, scabbing, violates the ABCDE criteria, or looks different from the rest should be considered worrisome and brought to the attention of a dermatologist immediately.